Life Music Laughter: Mission Monkey Minute: What's my Age, Again? 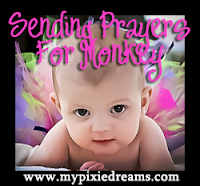 Today's Monday Minute has been renamed to support Michelle Pixie's daughter: Monkey. Read my answers, then head on over to show your support to Monkey's mom, and make sure to link up at The Daily Dose of Reality. 3 - If you were to write a book based on your life, what would the title be? Look Babe, I Finally Wrote a Book! 5 - The last question isn't a question. Write a story of a time of when you or someone you know overcame great adversity. : hmmm, well, there was this one time, no, that's not good enough, ooh ooh! no not that either. I think everyone has moments of adversity, and at the moment it's happening, it seems like you may never overcome, but you push on, and become stronger because of it. We were homeless, and without transportation, but we did all we could to take care of the kids and let them know we love them. When we talk about it now, the kids just remember the good times. They think it was fun, just, one big adventure. And, really, looking back; it wasn't the best of times, but how bad was it, really?! Wow! You were homeless and without transportation! Oh sweetie, now that is overcoming something big! I just wanna give you a big hug after hearing that. I don't know why..I am just a hugger! Thanks for stopping by.